One of my favorites. I like the lighting and also the sharp contrast of the knife edge ridges against the clouds and lower ridges. Je trouve vraiment tes photos de montagne vraiment incroyable de beauté. Les compositions sont vraiment TOP et que dire de ta gestion de la lumière ! J’adore tout simplement ! 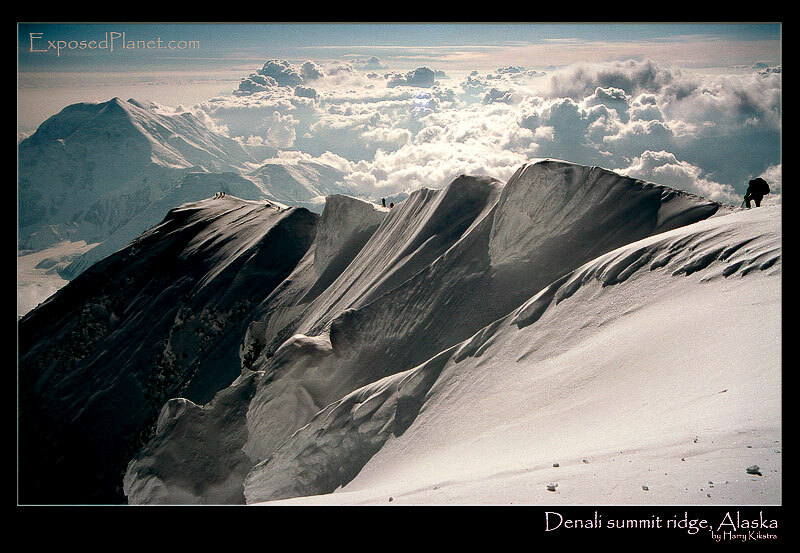 The story behind "Denali Summit Ridge from the summit, Alaska"
My 2nd summit of Denali was June 22 2003, so the 2nd longest day of the year. Though Denali is located slightly lower than the Arctic circle, its height almost makes up for it and the sun never really sets in this period. This is the view from the summit, the summit itself is not in the image. What you see is the last part of the climb to the highest point of North America, Mt Denali, sometimes called McKinley. It’s a wonderful climb and the last section takes you over knife edge ridges while showing you the wonders of icy Alaska; the huge mountain in the back is Mt Foraker. Most climbers on this image are going down, while I was taking some more pictures, warmly covered in a big down jacket.. Though it looks peaceful it was bloody cold this moment and my video camera quit after about 10 seconds of battery time. My Camera lasted longer, the old trusted EOS3 worked like a charm.